WTI crude prices have fallen back down into the $50.50-$51.00/b range this morning. WTI opened at $51.25/b today, a drop of $0.19, or 0.37%, below yesterday’s opening price. 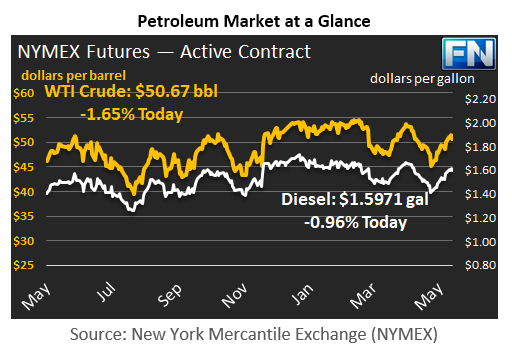 Current prices are $50.67/b, a continued fall of $0.69 below yesterday’s closing price. Crude and product prices rose and fell overnight, initially rising above closing levels then trending down in early morning trading. Diesel opened at $1.6076/gallon this morning. This was a decrease of 0.25 cents (0.16%) below yesterday’s opening price. Current prices are $1.5971/gallon, a decrease of 0.92 cents from yesterday’s closing price. Gasoline opened at $1.6548/gallon today, a significant drop of 1.37 cents, or 0.82%, from yesterday’s opening. Prices are $1.6396/gallon currently, down 1.3 cents from yesterday’s close. Headlines from OPEC are having a varied impact on prices. On the upside, Saudi Arabian Minister Khalid Al-Falih stated that a nine-month extension is almost assured. But prices fell when the Minister noted that deeper cuts were probably unnecessary. OPEC and non-OPEC members have been meeting for over a week leading up to today’s formal session in Vienna, and markets have been in reaction mode. The announcements have generally been confident and constructive. However, this may suggest that anything other than stellar results from the final agreement will disappoint the market. U.S. supply and demand data were constructive last week. For the third week running, the Energy Information Administration (EIA) has reported across-the-board inventory drawdowns: 4.432 mmbbls of crude, 0.787 mmbbls of gasoline, and 0.485 mmbbls of diesel. The crude drawdown greatly exceeded industry expectations, which had ranged from 1.5 mmbbls per the API and 2.7 mmbbls per Schneider Electric. 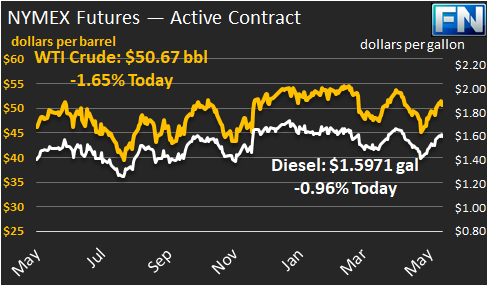 The gasoline and diesel drawdowns fell short of the API data. The gasoline drawdown closely matched the Schneider Electric survey. U.S. crude supply expanded last week. The EIA reported that U.S. crude production rose by 15 kbpd during the week ended May 19th. Crude imports decreased, but crude exports decreased as well, leaving a net surplus. Additional crude supply fed an increase in refinery utilization. Crude inputs to refining rose by 159 kbpd. Apparent demand for gasoline rose by 252 kbpd during the week, while diesel demand rose by 144 kbpd, and jet fuel demand fell by 263 kbpd. Overall, the Energy Information Administration (EIA) finds that U.S. gasoline supplies are abundant and prices are moderate moving into Memorial Day weekend. According to the EIA, “Relatively low crude oil spot prices, weaker year-over-year gasoline demand, and high gasoline inventories are all putting downward pressure on gasoline prices.” The EIA’s analysis follows as our second article today.